This is my entry into the Tessuti Gridlock Sewing Competition. First of all, can I compliment Tessuti for their outstanding delivery service? I placed the order for this fabric on a Sunday lunchtime (UK time), and it was with me – all the way from Australia – by Wednesday morning! Now that’s what I call speedy service. The competition was to design an outfit made from their Gridlock fabric, which is a jacquard type fabric made of cotton, poly and polyurethane. It has a light stone coloured background, with a beautifully textured blue embroidered surface (although some entrants have also used the reverse side to great effect). You could sew anything you wanted “Sew something that you’d like to wear, something that suits the fabric and something that suits you“. Also, the brief seemed to be to “[make something] you can wear often and can be worn as daywear”. Of course, for me, that was always going to be a dress. I was determined to use a pattern that was in my stash. There have been some great versions of New Look 6067, including the beautiful version that won the 2012 Little Black Dress competition over on PR.com. My review of the pattern is below. I will confess that when I initially opened the (beautifully wrapped) pack, I was a little nonplussed by the fabric. I mean, I didn’t hate it by any means, but I didn’t oooh and aaaahh over it straight away either. However, now that the dress is finished I have fallen in love with the fabric and the pattern. It is quite an unusual fabric, very modern, and I can see it suiting lots of complexions/ colourings. Whilst it is quite a hard fabric to photograph, I think (in real life at least) it looks like a quality fabric. The thing I like best about it though is the fact it suits slightly more structured garments, but has that polyurethane in it so the finished garment is not too stiff and constrictive. Enough about the fabric already! Let’s talk about New Look 6067. I love the bodice part of this dress the best. The clever pleating just moulds around the upper body to give a great shape. I also love the belt detail (very flattering). What I didn’t like was the instructions that came with the pattern…see below for major biaatching about that. Oh, let’s just get on with my review! 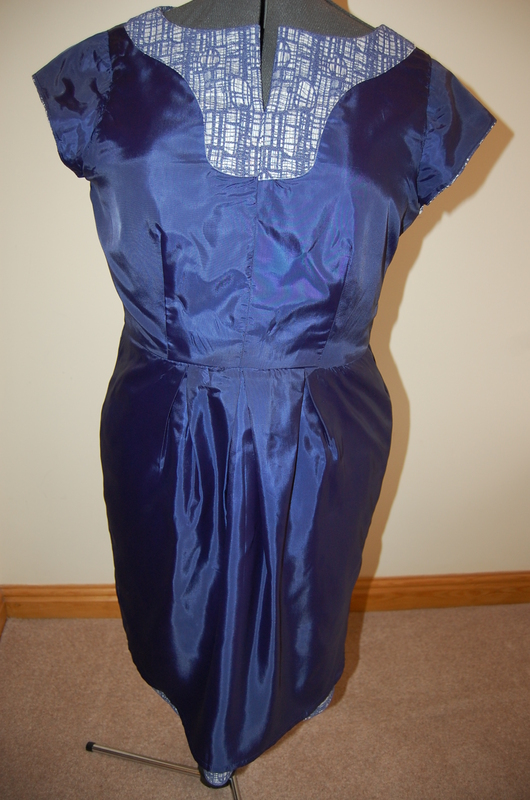 Misses’ pleated dress in two lengths with sleeve and belt variations. I made view C, with the neck and sleeves from view A. 6 – 16. I found a size smaller than my normal size fitted me fine in the bust and shoulders, with my usual enlargement over the hips. If I made this dress again I would probably have to make the hips larger still: there are still some diagonal pull lines at the hips. NO! In all fairness, all the instructions are there, but, as other reviewers have mentioned, they jump back and forth an awful lot. Also, they would have you insert the invisible zipper on top of the lining (so you will have to finish the raw edges first), and put the sleeves in last. I basically ignored the instructions and did my own thing. I love the bodice part of this dress the best. The clever pleating just moulds around the upper body to give a great shape. I also love the belt detail (very flattering). What I didn’t like was the instructions that came with the pattern. A jacquard type fabric from Tessuti fabrics made of cotton, poly and polyurethane, with an acetate lining. 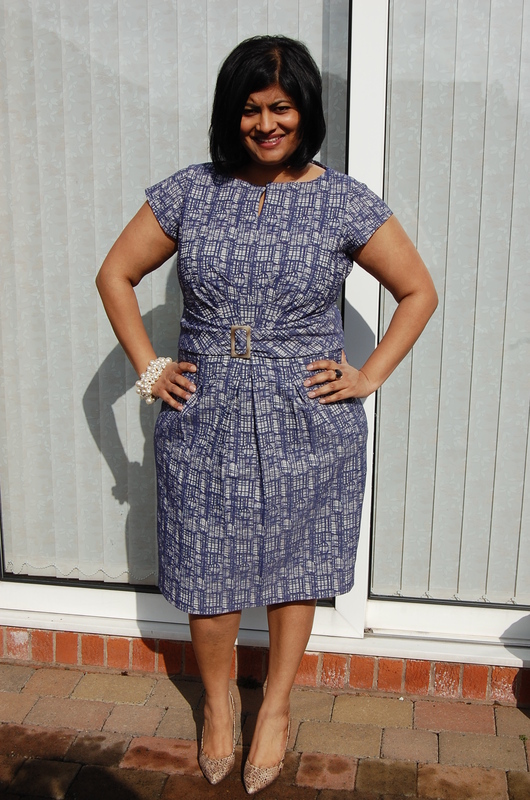 Enlarged the pattern to suit my measurements a tiny bit at the waist and more over the hips. Lengthened the skirt by 3 inches. Inserted a full lining. Yes, maybe. I think this is a very classy looking dress that would work in so many fabrics. Yes. I would recommend it. Love the combination of the fabric and the pattern. 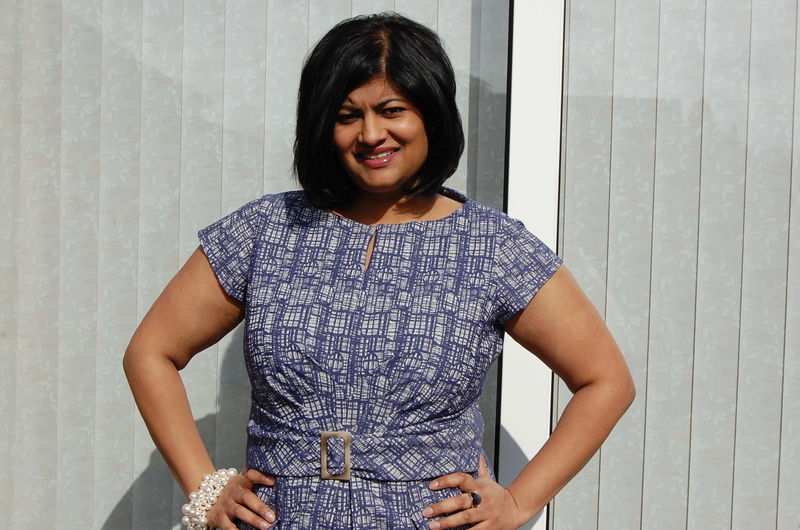 A classy, versatile dress. I used this great tip from Beth of Sunnygal Studio to get a clean finish to the facing: sew the fusible interfacing, right sides together, to the dress facing piece, then flip and press. So simple, but such a great tip! 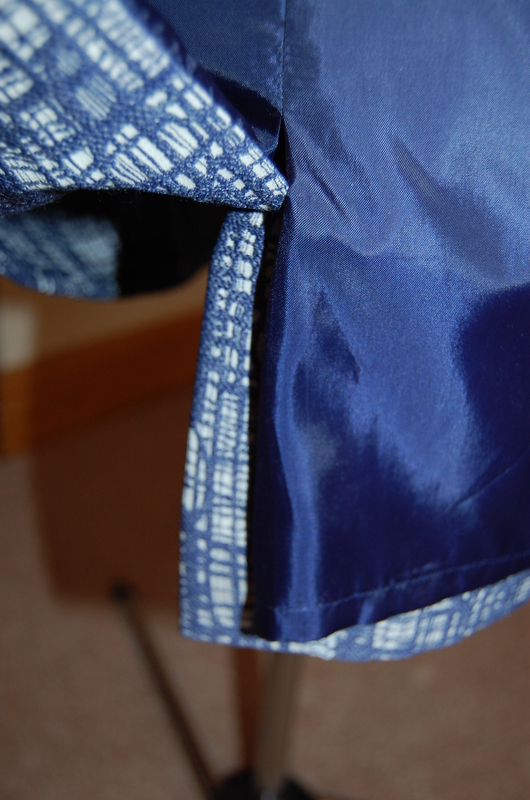 I used the tutorial from the The Slapdash Sewist to machine stitch the lining to the invisible zipper tape, and the tutorial from A Fashionable Stitch to sew the lining to the vent. 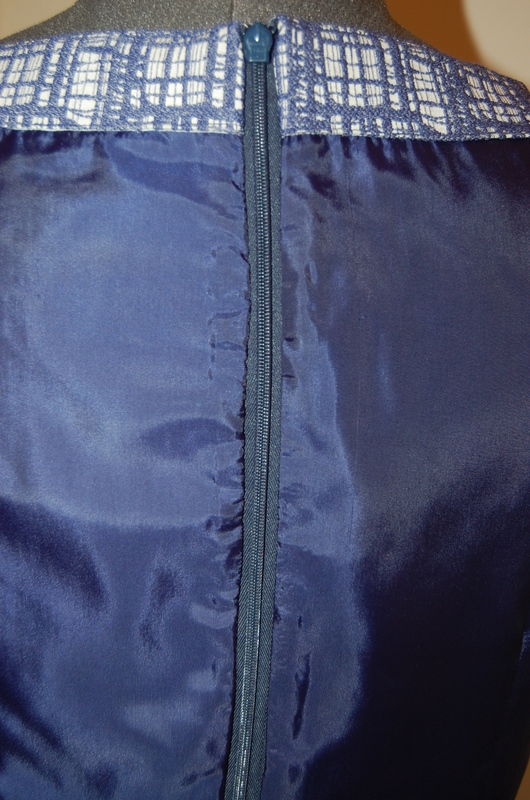 And I always refer to this tutorial by Amanda to sew in my invisble zips, and make sure the intersecting seams match. Head over to Tessuti’s pinterest page to see all of the entries….there are some jackets in particular which are amazing! That’s a gorgeous dress! The style is very flattering – those bodice pleats are lovely. I’ve seen posts about this contest on several other blogs, and although the fabric isn’t one I would necessarily choose myself, it does look very good in a variety of garments. It looks like it gives your dress plenty of structure but still lets it be comfortable. Wow that looks fantastic, my favorite dress you have shown. Perfect fabric choice and the shape is great on you. Lovely. Thanks Beth and thanks for the brill facing tip! This looks AMAZING on you!!!!!!!!!! Thanks Angela…hope the links are useful! 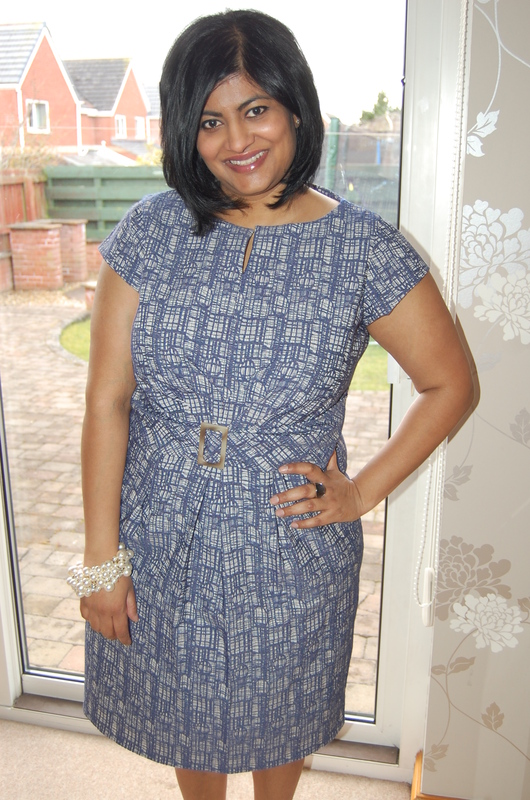 Gorgeous dress, Manju. Good pairing of fabric and pattern. This dress looks great on you. The pattern and fabric combo seems to work well. Looking forward to hearing about your success in the contest! Thanks margherita. I am very pleased with my dress but the competition is fierce! Not expecting to win but glad I took part…if nothing else it made me try that little bit harder! I LOVE your dress. All your hard work has paid off. It looks very professional and well made. That looks so smart! Thanks as well for all the tutorial links! How gorgeous. 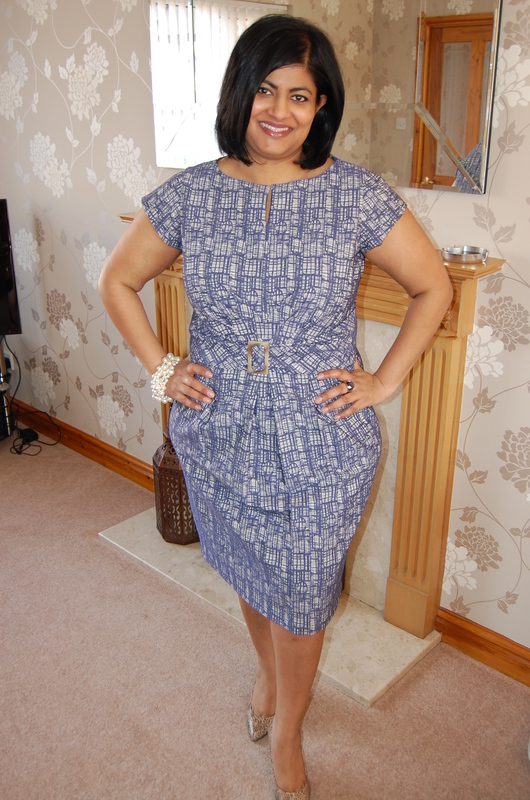 This is a great style on you and it fits you to a T.
Lovely dress and an inspired use of such fascinating fabric! Wow you look fabulous in that dress, very flattering! I wasn’t super interested in the fabric when they first announce this competition but now I have seen so many great entries I wish I’d played along! This dress is fabulous, I love your bracelet, your lining looks impeccable…good job! Did you have to pay $30 postage for the fabric or have I misread the website instructions? Hi benita. Yes that’s correct. Thank you, I loved your dress so much I have bought the pattern but haven’t been able to find any material that I think would look as good as yours yet. Brilliant result for you, well deserved.